Dr. Beaufrere with a few feathered friends. TOPIC: Common diseases per parrot species that have been presented at the Exotic Clinic at University of Guelph as well as atherosclerosis in parrots and what we can do to minimize these conditions with the parrots we live with. Dr. Beaufrère received his veterinary degree from the University of Lyon, France in 2006. He then completed a small animal internship in a private practice in Belgium in 2007 followed by an avian and exotic medicine internship at the Ontario Veterinary College the following year. Following his internships, Dr. Beaufrère enrolled into a combined PhD and Zoological Medicine Residency program in the Department of Veterinary Clinical Sciences at the School of Veterinary Medicine – Louisiana State University, Baton Rouge, USA and the Audubon Nature Institute, New Orleans, USA. In 2012, Dr. Beaufrère became a board-certified veterinary specialist in avian medicine both in Europe through the European College of Zoological Medicine (Avian) and in North America through the American Board of Veterinary Practitioners – Avian Practice. Dr. Beaufrère obtained his PhD degree in 2013 and also became board-certified in zoological medicine through the American College of Zoological Medicine in 2014. 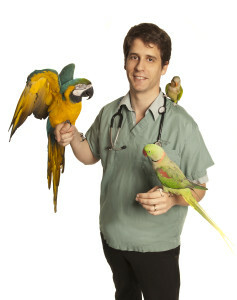 Dr. Beaufrère has extensive experience in companion avian and exotic animal medicine, raptor medicine and surgery, wildlife rehabilitation, and veterinary care of various captive zoological animal species and has published numerous book chapters and scientific articles (http://www.ncbi.nlm.nih.gov/pubmed?term=Beaufrere%20H%5BAuthor%5D). Dr. Beaufrère’s special interests are in avian cardiovascular diseases, raptor orthopedics, psittacine internal medicine, and veterinary biostatistics.